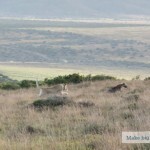 We read mixed reviews about Addo Elephant National Park. As a result, we heavily debated whether a visit to the game park was even worth our time and effort. We almost decided to skip it entirely since we had already booked a four night safari in Madikwe Game Reserve at the end of our time in South Africa. 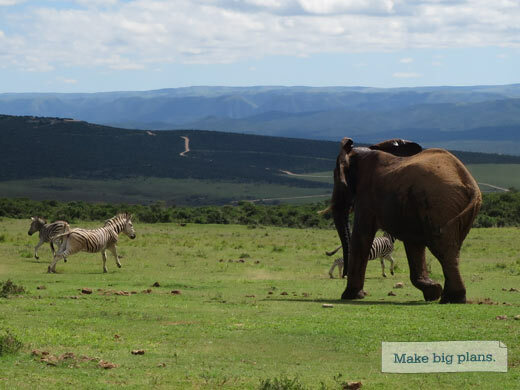 Ultimately, since we were so close, we decided to experience Addo for ourselves and were happy that we did. As the national park’s name suggests, elephants are the main draw. Although not guaranteed, it is highly likely to see elephants in the park and on arrival, we were pleasantly surprised to learn that dozens of other animals can be found in the park too—all endemic to the region. Most of the roads are asphalt or gravel and visitors can drive them all at their leisure to view the animals in their natural habitat. For an introduction to the park, we elected to take a “sundowner” game drive in one of the parks organized tours. Although we saw a few noteworthy animals like a water buffalo, Addo’s oversized vehicles—they seat more than 20 people—simply can’t provide the same caliber of animal viewing that we experienced in Amakhala and Shamwari. If you’ve been following our journey, Amakhala is where we had a run-in with an aggressive elephant, and that encounter left me debating whether we should even attempt to drive ourselves through Addo. There’s no way we wanted to repeat that encounter without a qualified guide. Even though Addo’s organized game drive was disappointing, the one thing it did do is put my mind at ease about what we could expect inside the park. 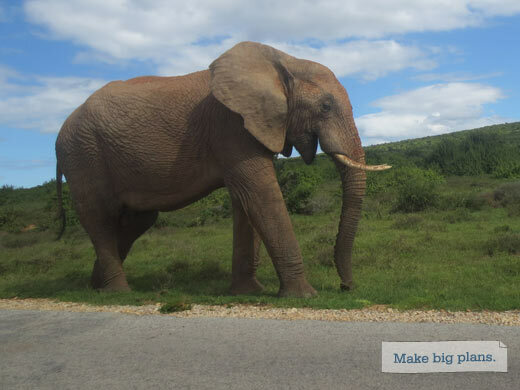 So, we ultimately decided to embark on our adventure and do a self-drive the next day … and we’re now convinced this is the best way to see Addo. We learned from our previous game drive in Shamwari that early mornings provide some of the best opportunities to see animals such as lions and cheetahs. So, we woke up before sunrise, equipped ourselves with binoculars, cameras, sunglasses, water and snacks and made our way into the park. Since we were staying at a lodge inside the park, we got early access to the reserve which is a nice bonus and another reason for us to get an early start. We entered the gates and were treated to pink hues illuminating the eastern sky as the sun rose over the horizon. With our heater on, windows rolled down and a cool morning breeze in our hair we enjoyed the sights and sounds of the morning including the birds chirping, a pack of zebra crossing the road, a couple of jackals playing alongside the road and several birds—including a hawk—surveying the land from the highest bushes and shrubs. The biggest treat of the morning happened at the Zuurkop lookout point, where we—alongside a handful of other cars—had the opportunity to witness the interaction between a spotted hyena and a lioness! When we arrived on the scene the spotted hyena was fumbling around with an aluminum can. He could only make it a few yards before the can would slip out of his grip. I was appalled at the sight of an animal with litter in its mouth, but as the hyena continued to struggle with the aluminum can, we noticed a crouching lioness carefully observing the hyena. Each time the hyena turned the direction of the lioness, she would lie down flat and disappear into the tall grasses. Oh my goodness! Did the hyena know the lioness was there? Will the lion attack? Do lions eat hyenas? How would this encounter unfold? The suspense kept us glued to our binoculars! Over the next several minutes we watched the scene unfold. At one point, the hyena turned his back to the lion which prompted the lioness to emerge from her hiding spot and slowly creep up behind the hyena as if to stalk it. About that time the hyena turned to face the lion, dropped the can and began to run. The chase ensued and they both disappeared outside of our viewing range! Spotting a spotted hyena. 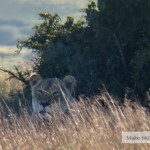 We had no idea a lioness was lurking in the grass. Lioness gives chase to the hyena. Lioness getting ready to nap for the day. We looked at each other in awe and couldn’t believe what we just witnessed. We were filled with curiosity and wondered how the encounter ended. 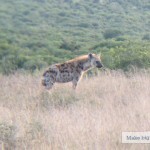 A few minutes later, the spotted hyena emerged from behind the bush and appeared to be unharmed. He returned to his previous spot and continued where he left off, fumbling with the can. But what happened to the lion? Where did she go? What was the chase about? We began to formulate a hypothesis that the lioness had made a kill and the hyena was waiting for the leftovers. Perhaps the lioness was simply chasing him away. We continued to observe the hyena, hoping to catch another glimpse of the lioness, but we’d lost sight of her altogether. There were several cars gathered in the area at this point and the viewing angles were somewhat limited. We evaluated our options to navigate around the cars parked in front of us. Then we noticed many of the passengers looking in a direction that was blocked from our view. We started our engine, nudged forward, and peered through the binoculars in the general direction others were looking. Low and behold, there was the lioness stretched out in the grass in the cool shade of a bush. Luckily we were able to snap a few photos before she laid flat and nearly disappeared from view. Unfortunately, we will never know the nature of the exchange between the hyena and the lion. 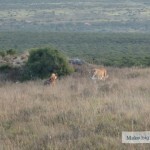 However, we will remember it as one of the most exciting things we observed during our visit to Addo. 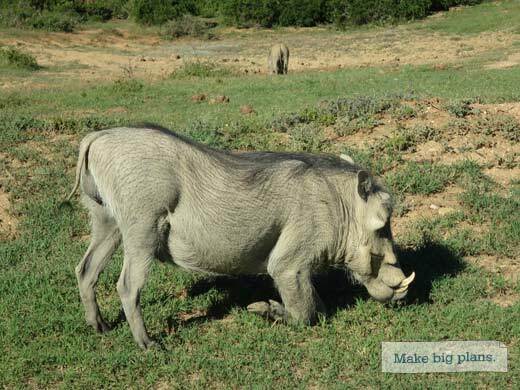 We observed lots of warthogs in Addo, many of which appeared to be small families: two adults and a pack of smaller offspring. They were cute and ugly at the same time! Did you know that warthogs kneel on their front legs when they eat? We had no idea, but had the opportunity to watch a couple of the hairy creatures eat their morning breakfast from their knees. 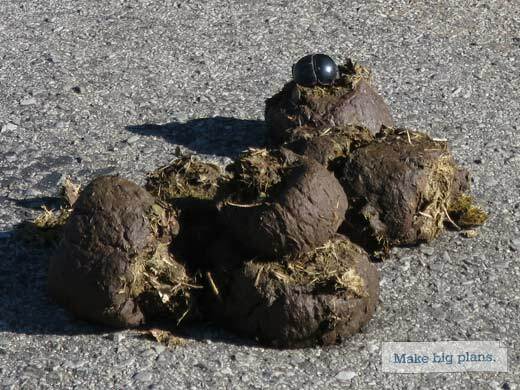 When entering the park, signs not only notify drivers of the speed limit but also that dung beetles have the right away. We kept our eyes peeled to ensure we abided to posted signs and managed to see several of the huge beetles crossing the road and making themselves at home in fresh elephant dung. After our successful morning drive, we returned to our cabin to shower and pack. The restaurant in Addo is actually quite good so we headed over there for a late breakfast and then back into the reserve to spend another few hours searching for animals. 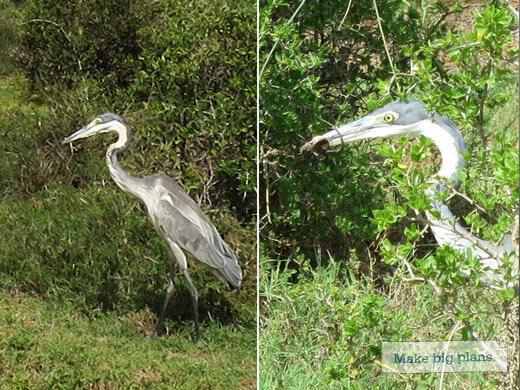 We took it slow and were rewarded with several chance encounters with some of the other endemic inhabitants of Addo. There were no shortage of unique birds to observe throughout the park. 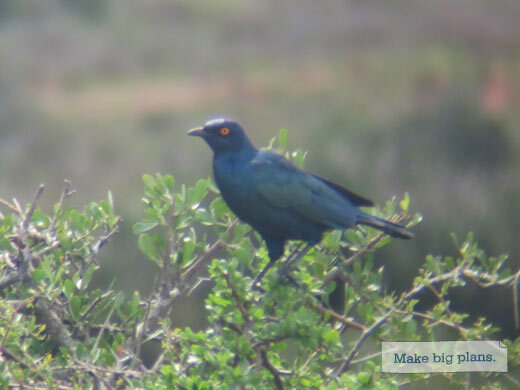 With the aid of our binoculars we watched some of the Red-Billed Oxpeckers. These birds have a bright red beak and some crazy yellow eyes! We also did a double take when seeing a massive Secretary Bird making a landing. The bird has long legs and a wide wing span similar to that of a hawk. Herring snatching a snake … then a lizard. While driving Gorah Loop, which is known as a good drive for viewing elephants, a Black-Headed Herron unexpectedly flew in front of our car and landed in the grass just a few feet from our front bumper. We’d seen them many times before and watched their funny walk. They stick out their long necks first and then slowly their feet and body catch up. This encounter was much more entertaining. As we observed, the bird dipped its head quickly into a small bush and when it returned to standing position, it had a small snake hanging from it’s beak! It opened and closed its mouth several times trying to re-position the snake and then took a large gulp and swallowed the snake whole! We had never witnessed anything like it before. And the snake was just the appetizer. We watch as the bird continued to hunt in the grasses next to our car. It stealthily crept forward and seemed to spot something else. With another quick motion towards the ground it scored a lizard for the main course! We continued along the Gorah Loop and made our way towards the watering hole. 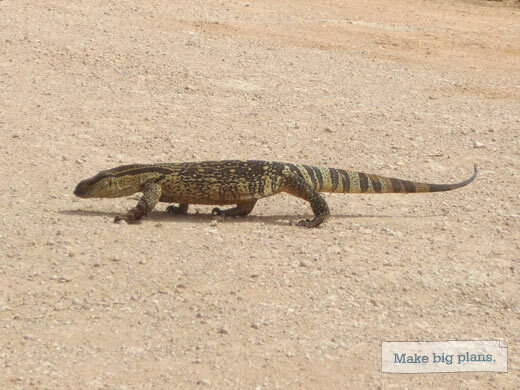 We slowed to allow a giant Rock Monitor Lizard cross the road. The lizard was sporting a limp. His left front leg did not appear to support his body weight, so every time he stepped on that foot, his body would take a dip close to the ground. As we pulled up to the watering hole, we found an elephant cooling himself in the water. A pack of four or five zebras kept their distance, patiently waiting for the elephant to leave. But the zebras seemed to grow impatient. One of the zebras edged towards the corner of the watering hole, almost as if to create a diversion. The elephant took offense and started moving towards the zebra. The zebra turned and started to trot away and the elephant followed, picking up the pace and eventually chasing the zebra down the road. Meanwhile, back at the watering hole, the remaining zebra had full access to the watering hole. They seemed to enjoy a leisurely drink and then continued to frolic as they moved on, away from the water. As we headed towards the park exit, we spotted a lone elephant eating bushes about 100 yards off of the road. We turned off our engine and decided to watch him as he ate his way down the hill towards our car. He looked friendly enough so we nicknamed him Burt. That was only fitting since we observed a different solo male elephant earlier in the day along the Gorah Loop that we nicknamed Ernie the Elephant. Anyways, Burt made his way down to the road and eventually was within 5 to 10 yards of our car. He did not seem to mind the spectators that had gathered watching him eat some of the 300 kilos of bush he eats per day. It was fascinating to watch Burt grasp a branch of foliage with his trunk, wrap it around his tusk and then use it to strip the leaves from the branches before placing it into his mouth. It was a fitting and perfect way to end our 24 hour stay in Addo Elephant National Park . At the end of the day we were thankful that we decided to experience Addo for ourselves. It provided us with a number of memorable encounters with the African wildlife. If we were ever to return, we would definitely choose the self drive option again. It allows you the opportunity to stop and appreciate the little things that you might not have the opportunity to see on an organized game drive.